Ack! I can’t believe it’s already Autumn! It feels like just yesterday that hubby and I were enjoying lunch breaks at the park and happy hours on patios downtown. Summer is my favorite season and it’s really sad to see it come to an end, and even sadder that we didn’t get everything accomplished on our Summer Bucket List. 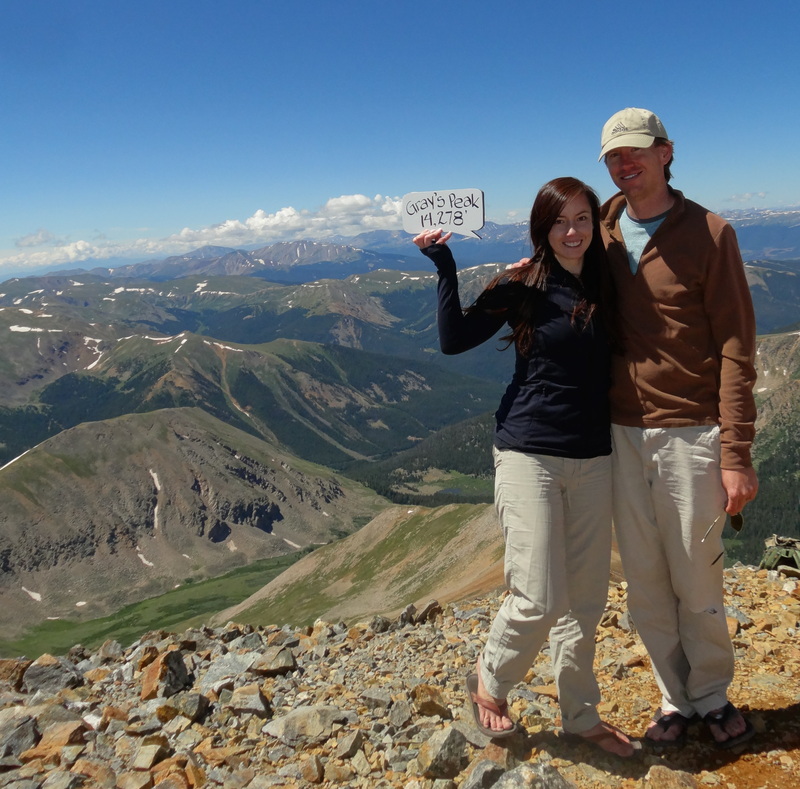 In fact, we didn’t really accomplish much after my last post about our Summer Bucket List. Part of it was because my brother visited, part of it was because of finances, part of it was because of an unusual number of baby showers I had to attend, part of it was because our dachshund Banana hurt her back, and part of it was because I got braces and was in so much pain that I didn’t want to leave the house for two good weekends. But mostly, it was because we were actually busy doing some of the things on our list. Here’s a recap of what we had already accomplished when I wrote the last post on our Summer Bucket List. Wash Park Paddle Boats – FAIL! Sadly, we never got around to this. It was hard to find a free weekend afternoon to get this simple bucket list item accomplished. It was much easier to watch Netflix on a free afternoon. Ha! We never got around to this big bucket list item. As we anticipated, there was too much planning involved and it was going to be too much of a chore to dig hubby’s backpacking gear and accessories out of storage. Maybe next summer! Much like the backpacking activity, this one was also a very ambitious task to put on our bucket list this summer and not very do-able considering a lot of our gear is buried in storage right now. But also, we are really out of shape for outdoor sport climbing. It’s best to do outdoor rock climbing when you’ve had a lot of practice indoors and feel confident and safe. This was not really our fault for not accomplishing. Unfortunately the tour company ended up being really flaky and difficult to book with. 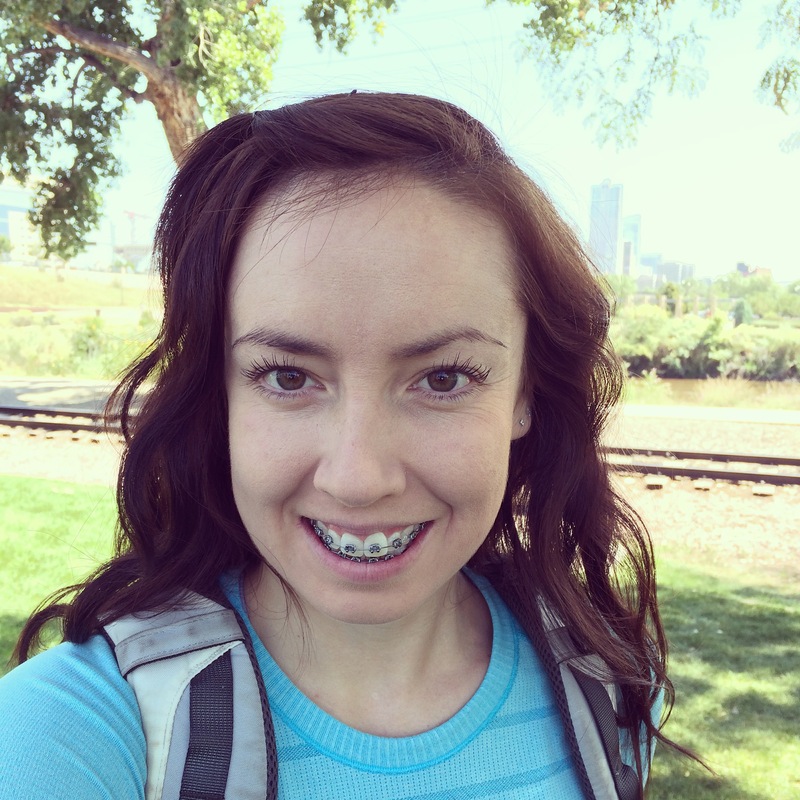 Such a shame because we were really looking forward to a fun food tour around downtown Denver! Although I have been hounding hubby about getting a fun pedicab ride ever since we came to Denver, it was really hard justifying a pedicab ride in the summer when we were Downtown at night. The weather is just too nice to not walk! So maybe this item is better suited as a winter bucket list item since you really just want to get from point A to point B as quick as possible when it’s zero degrees out. 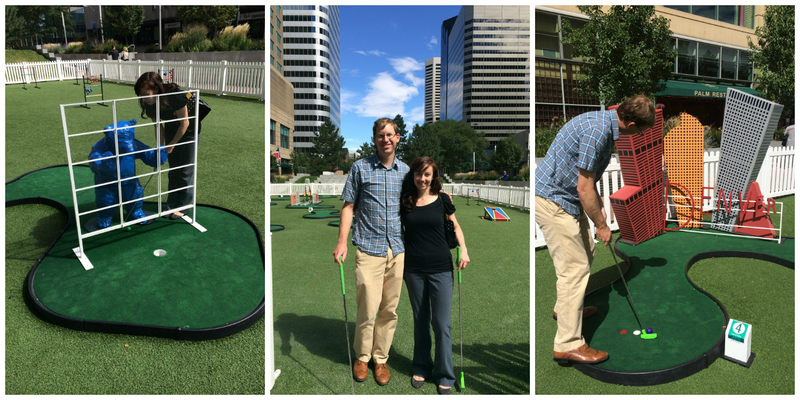 Miniature Golf Downtown – ACCOMPLISHED! Whew! 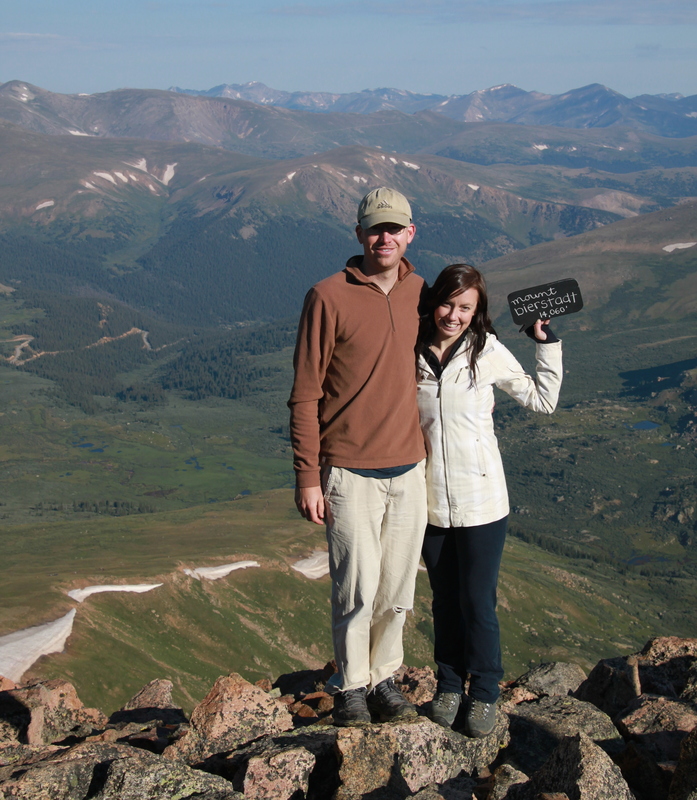 We had a lot of bucket list item “fails” there, but here is one we finally got around to doing. This should not have been a tough bucket list item to accomplish, but it was. We literally put this item off until the very last day of summer. We just never feel motivated to do anything exciting on our lunch hours and prefer to just zone out and unwind from the office work. It’s funny though that we watched the same group of guys from an office nearby, come and play miniature golf every single day all summer long. I should have, perhaps, gotten some tips from these guys who were probably pros by the end of summer because Bryce won at our lunchtime game of golf by a long shot. 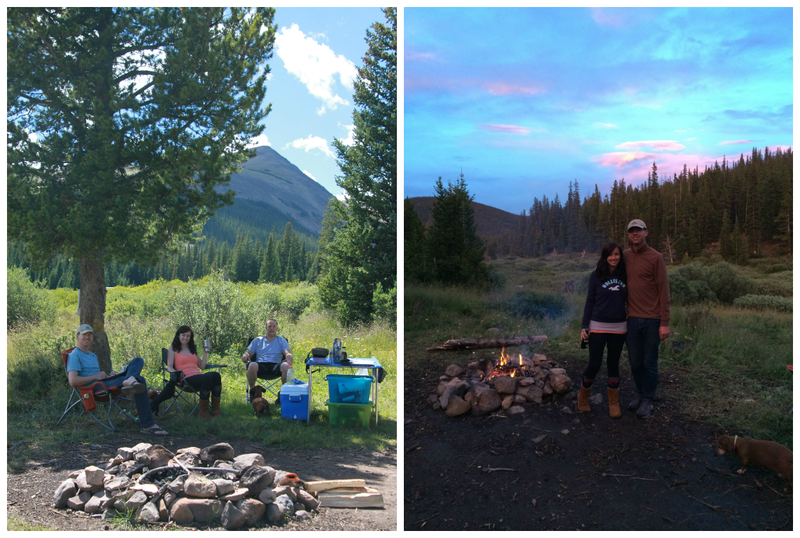 We did a few camping trips this summer, but had also hoped to go camping in Wyoming since we had never been. Unfortunately we never made it up north. 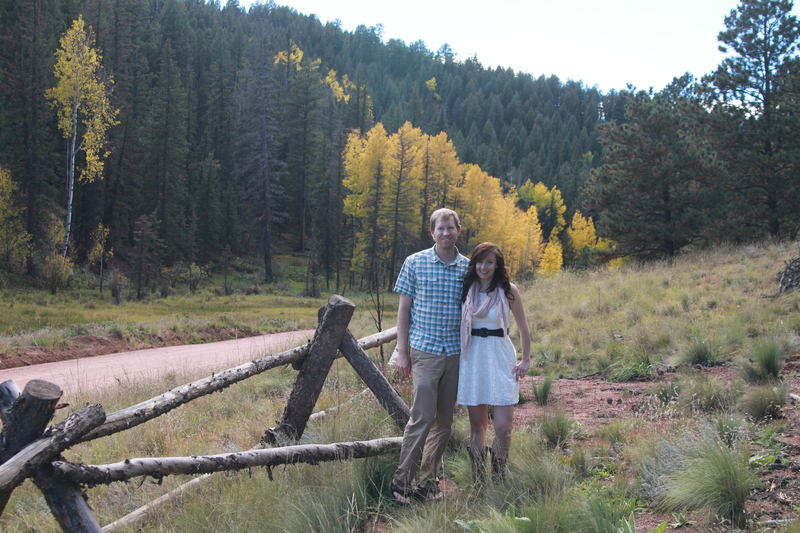 We did one more camping trip with my brother while he was in town and called it good. 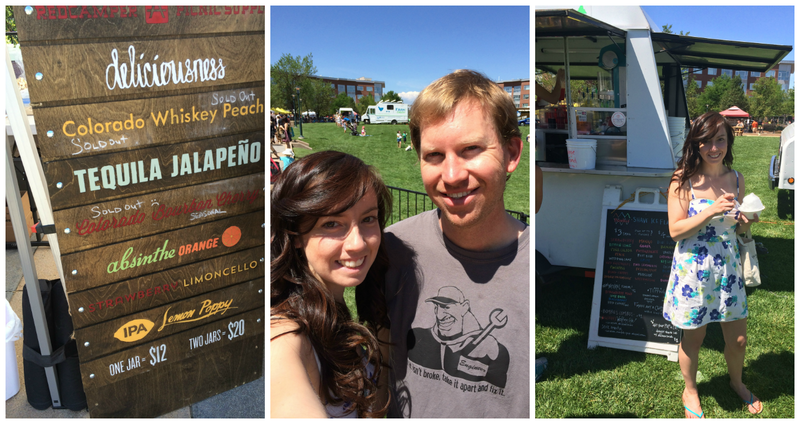 We made it to one more Farmers Market for the summer, which was a really fun one in a new home community called Stapleton. Swim with a Penguin – ACCOMPLISHED! Hubby thought I was absolutely ridiculous for buying an inflatable penguin for the pool, but hey, the box did say ages 3+. 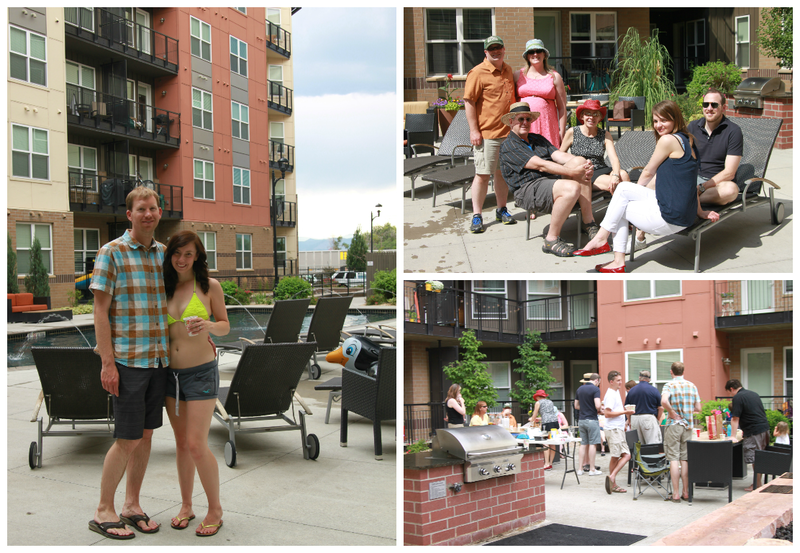 Family BBQ at our Apartments – ACCOMPLISHED! We were able to get most of the family in the area together for a BBQ at our apartments and it everyone had such a blast! We love throwing little parties! Can’t wait till we have a house! 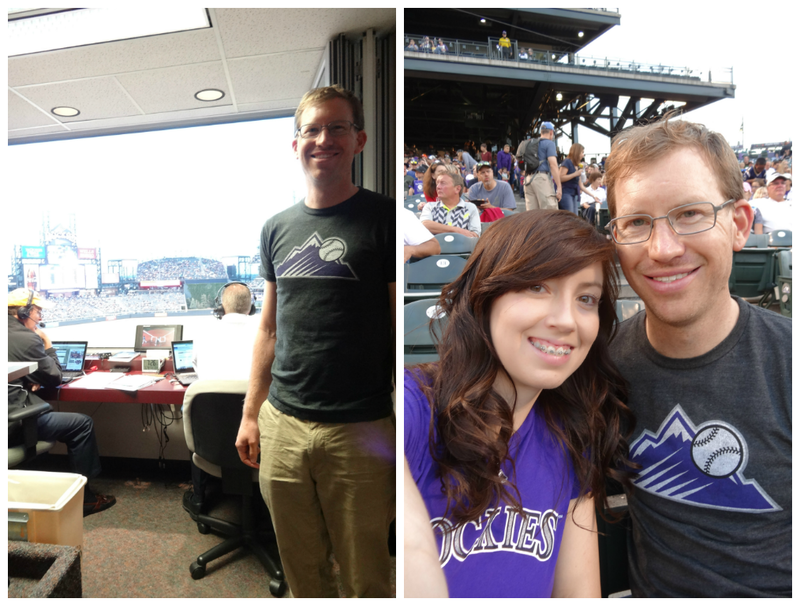 Colorado Rockies Baseball Game – We won tickets to this game from Bike to the Game Day and also got to visit a radio announcer booth during one of the innings. There you have it! Twelve out of 17 bucket list items accomplished! Not bad, but next summer we’ll surely do better!